Wood Family Furniture in Crystal River Florida offers 100% solid wood dining room furniture from only the highest quality manufacturers in the USA. 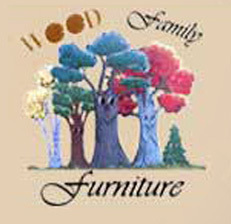 Wood Family Furniture only distributes high quality dining room furniture, kitchen tables, chairs, china cabinets, buffets, and hutches from the best manufacturers in the furniture industry such as Ariel's Oak, Rustic Natural Cedar Furniture Company, Hermes’ Table Shop, Wengerd Wood Products, and Oakland Wood. Our Amish builders allow you the freedom to choose the type of wood such as Cherry, Oak, Maple, Hickory, Black Walnut, etc. There are over 15 color finishes available, as well as the option to change sizes. This allows you the freedom to design your furniture the way you want it, no compromise! Rustic Natural Cedar Furniture Company has been manufacturing quality cedar products for the home and garden for over 30 years. Their broad variety of products includes bedroom sets, tables and seating groups, gliders, rockers, swings, arbors and other garden products. These fine furnishings are handcrafted with care in Quebec and British Columbia and shipped worldwide. Long-lasting good looks and low maintenance make cedar the natural choice for your home and garden décor. With the added benefits of beauty and comfort, cedar is an ideal choice for any setting.